Professor David Collins, renowned glacier scientist and pioneer in the field of glacier hydrology, passed away at the age of 68. A Fellow of the RGS-IBG and Chartered Geographer, David was a larger-than-life figure in the sometimes staid world of academia. He possessed an infectious energy and enthusiasm for science and adventure that was instrumental in inspiring generations of students to fulfil their potential and attain senior positions in academia, industry and commerce. Having graduating from Emmanuel College, University of Cambridge, in 1974, David commenced his doctoral studies at the University of Nottingham where he completed his thesis, entitled ‘Meltwater characteristics as indicators of the hydrology of Alpine glaciers’, in 1979 under the supervision of Dr Jean Grove. Following a brief period at the University of Liverpool in 1973, David took on the position of Lecturer at the University of Manchester in 1974, rising to the position of Reader by the early 1990s and achieving the degree of Doctor of Science in 1997. After a brief spell at the University of Oxford as Dean of Keble College between 1996 and 1998, David returned to Manchester, taking up the position of Professor of Physical Geography at the University of Salford in 1999. It was during his early years as an academic in the 1970s that David produced his most influential work. Focused upon the proglacial hydrology of Swiss alpine glaciers, David’s work utilising proglacial meltwater discharge, solute and sediment properties as tools to interpret and understand the hidden world of glacier drainage systems was pioneering, and acted as something of a catalyst for the development of glacier hydrology as the distinctive sub-discipline we know today. David’s legacy remains evident today, as researchers continue to develop investigative and analytical methods that build upon his early, pioneering work. David believed passionately in field research, adventure and the collation of long-term data sets. To this end he set up the ‘Alpine Glacier Project’ (AGP) while at the University of Manchester. The AGP was a long-term monitoring project, predominantly based on proglacial hydrological monitoring, whereby students would travel to Switzerland each year to maintain instrumentation, collect data and learn field skills. Over its almost 40 year history, the AGP enabled hundreds of students to ‘cut their fieldwork teeth’ and, aside from the collection of some of the longest records of glacier meltwater discharge and associated sediment load in existence, provided inspiration for many to develop careers in science. It is somewhat ironic that during the most fruitful years of the AGP, grant funding for long-term data collection was not in vogue, and yet these are the very data sets which are currently in high demand but short supply, as the long term impacts of climate change on the cryosphere become ever more apparent. David had a humorously mischievous streak, sense of adventure and somewhat ‘devil-may-care’ attitude when undertaking field research in the world’s more remote regions. Ranging from what became known as the ‘summer of love’ in 1979 on Peyto Glacier in the Canadian Rockies, to the glaciers in the South Cascades, David conducted field research wherever and whenever he could. His most adventurous fieldwork was undoubtedly that carried out in during his time at the University of Manchester, in the remote and hostile environment of the Karakorum Himalaya in Pakistan’s Northern Areas. David applied his tried-and-tested field investigative techniques to large Himalayan glaciers in Pakistan, recognising the vital importance of these glaciers as suppliers of freshwater to millions. David provided invaluable data from a region significantly under-studied until relatively recently, as the consequences of climate change on freshwater production have become apparent and concerns over future water resource availability have been heightened; David was indeed ahead of his time. David worked tirelessly for numerous learned societies, most notably for the International Union of Geodesy and Geophysics (IUGG) where he was Chair of the UK National Committee and Chair of the IUGG Finance Committee. 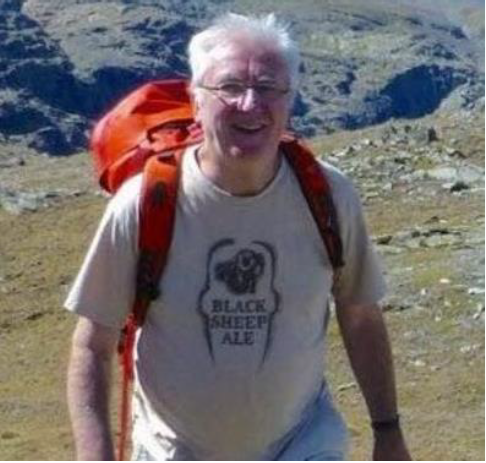 He was also a leading figure within the International Glaciological Society (IGS), the Geographical Association (GA) and the International Association of Hydrological Sciences (IAHS). David was regarded with great affection and warmth by all those who worked closely with him. He was naturally an altruistic individual who cared for all those who called upon him; he offered unconditional friendship and support to all. He was a fun-loving individual, as happy in a bar or nightclub as he was in his beloved mountains. His sense of humour was legendary, invariably provoking laughs at the expense of others, but always in a friendly and genuinely fond manner, with no hint of malice. His mischievous nature inevitably brought him into conflict with more senior academics on occasions, but he always knew where to draw the line, giving respect where respect was earned. Despite a plethora of nicknames he gave to colleagues and students alike, friendship was always assured, no matter what an individual’s perceived inadequacies, inadequacies usually associated with the nicknames he allocated! David was a truly free spirit and his love of adventure, of the mountains and of science has left a lasting legacy in the form of his published research. But perhaps his most significant legacy is the extended international family of former students and colleagues he leaves behind, who he brought together through his infectious friendship and warmth, and for whom he cared passionately and inspired always.